If you are into prog, and buy only one album this year, by all means, make it this one. 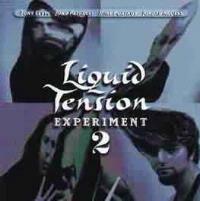 The first Liquid Tension Experiment album was wonderful, and this one is even better. The music here runs the spectrum from frantic metallic fury to sedate jazzy moments, and everything in between. The musicians on this album are Jordan Rudess, Tony Levin, John Petrucci and Mike Portnoy. Ripping guitar starts off this cut, joined quickly by the other instruments. The piece at times calls to mind Malmstein, but with much more emotion and passion. The keyboard work here is phenomenal, and the composition has a definite classical tone and texture. It covers lots of different textures and modes, even going a bit jazzy for quite a while. At times there is a definite Joe Satriani leaning. In sharp contrast to the fury of the last number, this one starts off with gentle and evocative piano work. Shortly, more rock oriented textures emerge, but in a very definite `70`s prog style. This segment, ala old Genesis or Kansas, plays for a time, then the mode switches back to the earliest styles of the song. This time however, those themes are given a treatment by the full band. Biaxident is a wonderfully progressive piece that keeps building and features fantastic musicianship by all the members. The keyboard work in particular really catches the listener`s attention, and a guitar segment that is a bit in the vein of Al Dimeola certainly shines as well. Some of the percussive textures are a bit unusual, and the song has Yesish tendencies at times. Other segments include a very jazz oriented one and an ELPish movement. This is a powerful piece that really combines jazzier prog (ala Relayer Yes) with the guitar-based rock of Satriani and other elements. Starting off in very atmospheric tones much like Levin`s solo work, the piece moves to more high-energy jazzy material with strong prog leanings. The piece contains some wonderfully passionate moments, and includes a definite European flavored segment and other ethnic leanings at times. It also features very metallic flashes of fury in its nearly ten minutes running time. The group was working on this particular cut when John Petrucci`s wife went into labor, so they had to finish it later. This fact is reflected in the title and the sound of a baby crying at the onset. From the baby, the song goes into delicate keyboard elements. The cut progresses into more rock oriented modes for a time with some intriguing timing changes. Then it drops back down in intensity, settling into a competent piano based segment. This one gets very jazzy at times, and quite unique. Almost taking on a jazzy old movie theme song texture occasionally. The rhythm section is very unusual. Jazzy elements, classical, old Cooper and West Side Story seem to merge on this one with the prog and metal influences. It also includes some very Wakemanesque keyboard parts at times. This song is of epic proportions at nearly 17 minutes. Some of the keyboard sounds seem very much like Jon Lord`s textures in his Deep Purple days. Baby crying is also heard once within the song. The composition ends with a snippet of fast paced silent movie type music. Starting with sound effects based sounds, ala Pink Floyd, this cut becomes a metallic riff-driven number a bit reminiscent of Led Zeppelin and Nazareth. The cut takes on more progish directions, still leaning heavily on this metallic groove. There is an extended spooky, effects based break in the piece. It then moves in slower, almost balladic directions. It continues on in many more directions, percussive based, then funky, and just plain fun. This cut packs lots of musical elements, styles and changes in to one piece, and it includes some very low bass sounds. Starting with sedate and jazzy keys, this mellow track sets a nice contrast to the previous one. It is essentially a sedate but intricate jazz oriented progressive rock piece that creates a nice mood. A pretty balladic piece with strong prog elements, Hourglass makes a very satisfying conclusion to the album.